An Unfortunate Anniversary – Jimi Hendrix and What Killed Him? Johnny Allen Hendrix (otherwise known as James (Jimi) Marshall Hendrix) was born in Seattle in November of 1942, thereby founding the “Live in Seattle if you Want to Be a Talented Musician” act. Seattle, where it rains so much the only thing to do is play music. Hendrix has practically become another name for guitar. His effortless skill, dripping passion, and innovative creativity for the six-stringed sound-producer has elevated him to the status of legendary in the eyes of practically all who have ever listened to a G-chord once in their lives. If one took the average top five of every “Best Guitarist” poll created in the past 50 years, Hendrix would not only be in the top five, but also he’d probably be first. Now we can sit here and debate whether Hendrix’s short spurt of talent makes him better than guitar gods like Clapton, Allman, King, Vaughan, etc., but that debate is pretty much endless. Simply, they are all great guitarists, and Hendrix, despite only living to 27 years old, is with the group. On Sept. 18, 1970, 41 years ago, Jimi Hendrix died in London. I know I am two days late on the anniversary, but since Tuesdays are now reserved for music news (when interesting), I thought I would do my anniversary post today. Much mystery surrounds Hendrix’s death. 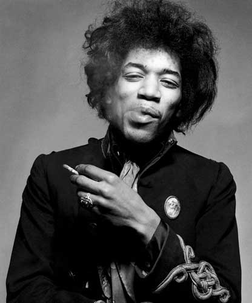 The initial report is that he asphyxiated on his own vomit after consuming a copious amount of red wine, but John Bannister, the surgeon who treated Hendrix and made this claim, was accused by Monika Dannemann, Hendrix’s girlfriend at the time, of malpractice, and was reprimanded for two counts of medical malpractice, and struck off the medical register for fraud in 1992. Apparently, according to reports, Hendrix had little alcohol in his system. Dannermann’s account of the night, though, have changed from interview to interview and she committed suicide shortly after being found guilty of contempt of court for repeating a libel against Kathy Etchingham, another of Hendrix’s girlfriends in the 60s. A recent book released by a former Animals’ roadie named James “Tappy” Wright claimed that Hendrix was murdered because he wanted to end his management contract, but this report was repudiated by Bob Levine, Wright’s long term business associate and Mike Jeffery’s (Hendrix’s manager at the time) assistant manager in New York. Levine said that Wright made up these stories to sell a book. In the book, Wright has commentary by John Bannister saying that is is plausible that Hendrix could have been murdered. The death may forever remain a mystery. Conflicting reports make a true reason-of-death out of reach. A conservative guess would be that the report above is true, but, where there is mystery, there will always be speculation. And where there is speculation, there will always be conspiracy theories. The best guess is your own produced from unbiased sources. But, as the article above concludes, despite everything, Hendrix was still dead on the morning of Sept. 18 and the world mourned. Here is Hendrix performing “Red House” at Royal Albert Hall in London on Feb. 24, 1969. I am a Jimi Hendrix fan. I LOVE Jimi Hendrix. I believe the fact that he is gone deserves the highest priority of investigation. He is missed. I am not afraid to ask Scotland Yard to finish what they started, for God’s sake. Thank you, C.